It was another beautiful day in paradise at The Powel Crosley Estate in Sarasota on Friday, May 24, 2013 for Jessica and Neal’s wedding ceremony. Kelly looked beautiful as she was escorted by her mother and god-father across the lawn to join Neil under their wedding canopy with an amazing view of the Inter-coastal Waterway as their backdrop. There, in front of their family and friends, the couple shared their vows, exchanged rings, and were pronounced husband and wife by Rev. Rick Lackore of Sensational Ceremonies, LLC . Music, Sound and Emcee, by Frank Lebano; Wedding Cake by Alla Levin of The Cake Zone; Catering by Milan Catering http://www.milancatering.com/ ; Floral and Décor by Yelana Riches of Elegant Designs Floral Art Studio; Venue Coordination by Maribeth Liberty of The Powel Crosley Estate all under the coordination of Alexis Alexander, Deisgn and Event Planner with Milan Catering & Event Design, LLC. 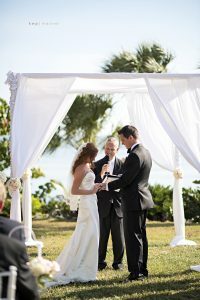 This beautiful picture of Jessica and Neil during their ring vows provided by Kristen Weaver of Kristen Weaver Photography. Congratulations to the new Mr. and Mrs. Neil Dotey!